Get active (alive) constraint segments. Get all (alive and dead) constraint segments. numExpectedVertices specifies the number of points that will probably be inserted. This is a default parameter that does not need to be specified. By default the internal data structures are initialized for 3 points and they are automatically reconfigured later if necessary. This method establishes conforming constraint segments and zones which depend on them. For technical reasons conforming constraint segments are not immediately established but inserted at the end of the triangulation process. This step must be triggered manually i.e., it is up to the user to call applyConstraintsAndZones() before the resulting triangulation is used. If afterwards the triangulation is changed in any way, applyConstraintsAndZones() must be called again. Checks the validity of the data structure. msg is a debug string that will be shown in terminal output so that you know which checkValidity call currently runs. This method is thought for development purposes. Don't call it method unless you assume that something is wrong with the code. If no points have been inserted yet, then the returned Bbox2 object is invalid and its member function Bbox2::isValid() returns false. vSegments are segments which shall appear as edges of the triangulation. The segments may be automatically reordered and reoriented, see bOrientedSegments below. CIS_CONSTRAINED_DELAUNAY inserts the constraint segments without subdivision unless existing vertices or existing constraint segments are crossed. This is the recommended constraint insertion strategy for most cases. Better shaped triangles are made around conforming constraint segments. 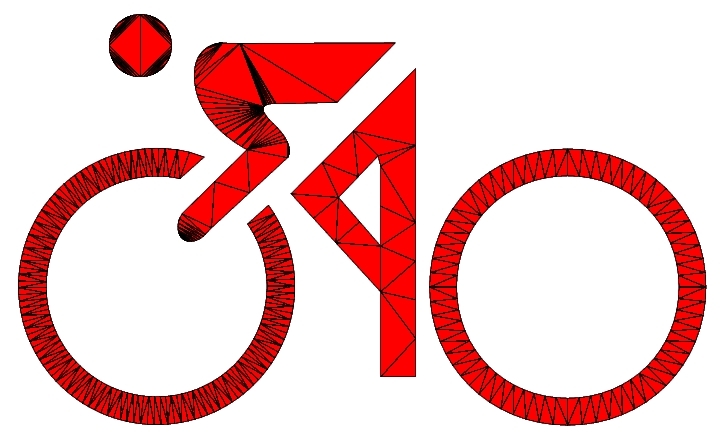 Be aware that well shaped triangles can also be obtained with CIS_CONSTRAINED_DELAUNAY when the mesh generator is used afterwards. See refineAdvanced(). Conforming constraint segments may enforce a huge number of tiny triangles in narrow geometric settings and full insertion may even be impossible in extremely narrow situations. Conforming constraint segments are not immediately established, see applyConstraintsAndZones(). CIS_CONFORMING_DELAUNAY_SEGMENT_LEVEL is the same as the strategy CIS_CONFORMING_DELAUNAY except that split points are not projected to an existing surface but their height is interpolated between the endpoints of the segment to be inserted. bOrientedSegments specifies whether the segments in vSegments are oriented (oriented, not ordered!). To maintain backwards compatibility bOrientedSegments is a default parameter and it defaults to false. Fade will maintain the orientation of the segments only when bOrientedSegments=true. This regards functions like ConstraintGraph2::getPolygonVertices() when the order of the returned vertices is important. Another consequence is when later a Zone2 object shall be constructed from this ConstraintGraph2. This is only possible if either this value is true (then the algorithm will assume that all segments exist in counterclockwise orientation) or when the value is false and the segments can be automatically reoriented and reordered such that they form one closed polygon. Figure 4: Constraint insertion with CIS_CONSTRAINED_DELAUNAY. Figure 5: Constraint insertion with CIS_CONFORMING_DELAUNAY. The inserted segments are automatically subdivided. A Zone2 object is an area of a triangulation, possibly bounded by a ConstraintGraph. zoneLoc is ZL_INSIDE, ZL_OUTSIDE or ZL_GLOBAL. pConstraintGraph points to a formerly created ConstraintGraph2 object (which must contain a simple polygon) or is NULL in case of zoneLoc==ZL_GLOBAL. bVerbose is by default true and causes a warning if NULL is returned. a pointer to the new Zone2 object or NULL if no triangles exist or pConstraintGraph->isOriented() returns false. [in] vSegments specifies a simple polygon. [in] bProtectEdges specifies if existing triangles shall be protected with constraint segments. a Zone2 object consisting of all triangles inside the polygon or NULL when the operation has failed due to wrong preconditions. Properties: The input polygon ( vSegments) does not need to have certain height values, the z-coordinates are computed automatically. 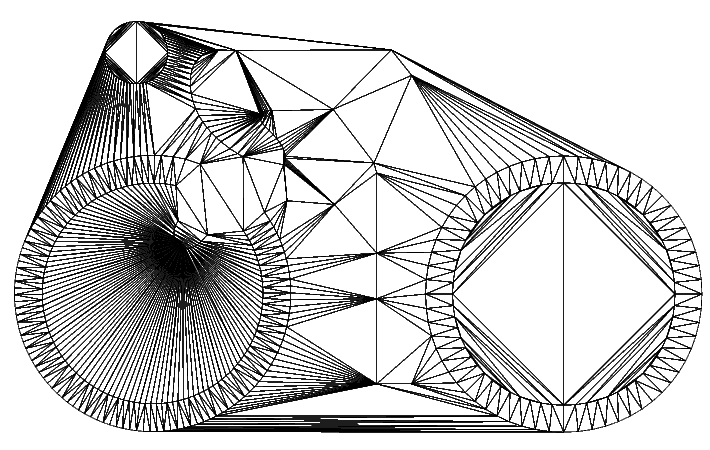 The input polygon is automatically trimmed when it is outside the convex hull of the triangulation. Insertion of intersection points could flip existing edges in the triangulation, this can be avoided using bProtectEdges=true. The operation may create constraint segments. 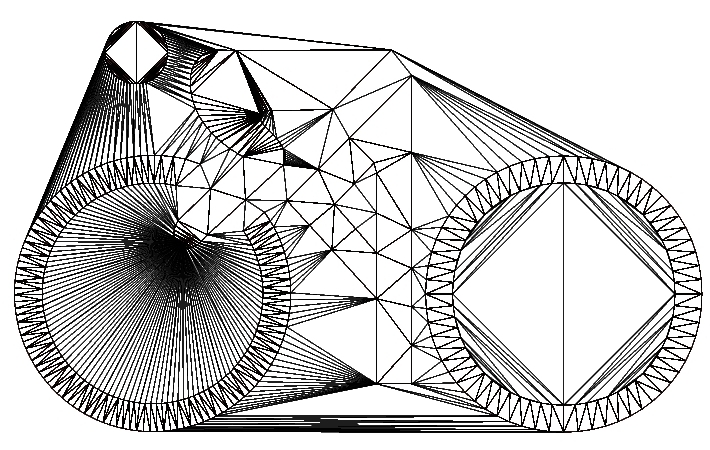 bTurnEdgesIntoConstraints turns all 3 edges of each intersected triangle into constraint segments. This method inserts a constraint edge knife(knifeStart,knifeEnd). If existing edges E are intersected by knife, then knife is subdivided at the intersection points P.
In any case knife will exist (in a possibly subdivided form) in the result. But a consequence of the insertion of the points P is that the edges E and even edges which are not intersected by knife may be flipped. Use bTurnEdgesIntoConstraints=true to avoid that. The intersection point of two line segments may not be exactly representable in double precision floating point arithmetic and thus tiny rounding errors may occur. As a consequence two very close intersection points may be rounded to the same coordinates. When more than one knife segment is inserted then the method void cutTriangles(std::vector<Segment2>& vSegments,bool bTurnEdgesIntoConstraints) should be used. The reason is that each individual cut operation changes the triangulation and thus iterative calls to the present version of the method can lead to a different result. Same method as void cutTriangles(const Point2& knifeStart,const Point2& knifeEnd,bool bTurnEdgesIntoConstraints) but it takes a vector of segments instead of a single segment. This is the recommended method to cut through a triangulation when more than one knife segment exists. Zone2 objects are automatically destroyed with their Fade_2D objects. In addition this method provides the possibility to eliminate Zone2 objects earlier. Zones are designed transparently: When two zones Z1 and Z2 are combined to a new one Z3 (for example through a boolean operation) then Z1,Z2,Z3 form a tree such that changes in the leaf nodes Z1 and Z2 can propagate up to the root node Z3. For this reason Z1 and Z2 must be alive as long as Z3 is used. Deprecated: Use setNumCPU() instead. This method is kept for compatibility with existing applications. Internally it calls setNumCPU(0) to automatically determine and use the number of available CPU cores. Recall the counter-clockwise enumeration of vertices in a triangle. If (p0,p1) is used, the unique triangle with the CCW oriented edge (p0,p1) is returned, using (p1,p0) one gets the other adjacent triangle. bAllVertices determines if all convex hull points are returned or if collinear ones shall be removed. [out] vConvexHullPointsOut is used to return the convex hull vertices in counterclockwise order. The start vertex is the leftmost vertex. If more than one leftmost vertex exists, the bottommost of them is the start vertex. Computes the height (z) at the coordinates x and y, assigns it to heightOut and returns true if successful. [in] pApproxT can be set to a nearby triangle. If unknown, use NULL. pApproxT is an optional parameter to speed up the search in case that you know a nearby triangle. But point location if very fast anyway and if you are not sure, using NULL is probably faster. Due to rounding errors your query point may lie slightly outside the convex hull of the triangulation and in such a case the present method would correctly return false. But you can use the optional tolerance parameter (default: 0): If your query point is not farther outside the convex hull than tolerance then the height of the closest point of the convex hull is returned. that the lifetime of data from the Fade2D datastructures does exceed the lifetime of the Fade2D object. vAllPoints is an empty vector of Point2 pointers. Stores pointers to all vertices of the triangulation in vAllPoints. The order in which the points are stored is not necessarily the insertion order. For geometrically identical points which have been inserted multiple times, only one pointer exists. Thus vAllPoints.size() can be smaller than the number of inserted points. This method imports triangles into an empty Fade object. The triangles do not need to satisfy the empty circle property. bReorientIfNeeded specifies if the orientations of the point triples shall be checked and corrected. If the point triples are certainly oriented in counterclockwise order then the orientation test can be skipped. bCreateExtendedBoundingBox can be used to insert 4 dummy points of an extended bounding box. This is convenient in some cases. Use false if you are unsure. This method requires 100% correct input. A frequent source of trouble is when client software reads the points that shall be used from an ASCII file. The ASCII format is convenient but it can introduce rounding errors that cause intersections and flipped triangle orientations. Thus it is highly recommended to transfer point coordinates with binary files. See also readPointsBIN() and writePointsBIN(). The triangulation keeps a copy of p. The return value is a pointer to this copy. If duplicate points are inserted, the triangulation does not create new copies but returns a pointer to the copy of the very first insertion. This method offers a very good performance but it is still faster if all points are passed at once, if possible. As long as all inserted points are collinear the triangulation does not contain triangles. This is clearly the case as long as less than three input points are present but it may also be the case when 3 or more points have been inserted when all these points are collinear. These points are then in a pending state, i.e. they will be triangulated as soon as the first non-collinear point is inserted. Figure 2: Triangles are generated as soon as the first non-collinear point is inserted. 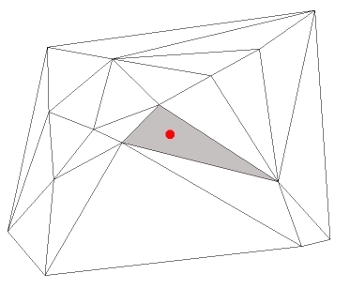 Returns whether the edge in triangle pT which is opposite to the ith vertex is a constraint edge. Returns whether the edge (p0,p1) is a constraint edge. Returns whether the vertex pVtx belongs to a constraint edge. The Fade_2D class can be used as a data structure for point location. This method returns a pointer to a triangle which contains p.
This method evaluates the performance of single- and multithreaded point insertion into a Delaunay triangulation. The method cleans up the triangulation (objects, memory) on exit. Thus the time measured outside this method may be slightly larger than the returned time that is exactly the time needed to triangulate the input points. Due to possibly duplicate input points the number of points is not stored somewhere but freshly computed in O(n) time. This is fast but you are adviced to avoid calling this method over-frequently in a loop. Duplicate point insertions count only once. the number of triangles in the triangulation (or 0 as long as is2D() is false). Creates a mesh inside the area given by a Zone2 object. pZone is the zone whose triangles are refined. Allowed zoneLocation values are ZL_INSIDE and ZL_BOUNDED. minEdgeLength is a lower threshold on the edge length. Triangles with smaller edges are not refined. maxEdgeLength is an upper threshold on the edge length. Triangles with larger edges are always refined. The behavior of the present method had to be changed in Fade v1.39: Only ZL_INSIDE and ZL_BOUNDED zones are accepted. But you can easily convert other types of zones to ZL_BOUNDED using Zone2::convertToBoundedZone(). This method calls an advanced Delaunay mesh generator and grid mesher. The parameters are encapsulated in the MeshGenParams class. This class provides default parameters that can be used as is. Alternatively client code can derive from MeshGenParams and overwrite the methods and parameters to gain full control over the mesh generation process. pVertex must not be a vertex of a ConstraintGraph2 or ConstraintSegment2 object. If this is the case, the vertex is not removed and a warning is issued. numCPU is the number of CPU cores to be used. The special value numCPU=0 means: auto-detect and use the number of available CPU cores. This setting affects Fade_2D::measureTrianguluationTime() and Fade_2D::insert() which is by default single-threaded to avoid undeliberate nested multithreading (an application may run Fade in a thread). For technical reasons points should be inserted before any constraint segments so that the algorithm can fully benefit from multithreading. Fade continues support for very old compilers and systems but multithreading is not available for VS2008, VS2010 and CentOS6.4 library versions. show() is a convenience function for quick outputs with a default look. It is also possible to use the Visualizer2 class directly to draw arbitrary circles, line segments, vertices and labels with custom colors. postscriptFilename is the output name, i.e. "myFile.ps"
This overload of the show() method allows to add further geometric primitives to the Visualizer2 object before it is finally written. The postscript file must be finalized with Visualizer2::writeFile(). Prints mesh statistics to stdout. Visualizes the current triangulation. The *.obj format represents a 3D scene but can also be used with 2D triangles (all z-values are zero then). Visualizes a Zone2 object. The *.obj format represents a 3D scene but can also be used with 2D triangles (all z-values are zero then). Made for terrain visualizations in 2.5D but will work also for 2D.